It took a long time for me to tell this story. But after a year and a half, I think it’s time to share. As a travel blogger, it’s important to be transparent about the good, the bad and the ugly of traveling. The situation I’m about to detail for you hindered my travel writing a bit but it also made me stronger as a human being. My desire to write this past year wasn’t as strong as it was when I first started and hopefully by the end of this blog post you’ll understand why. This is a long and graphic story so readers beware. Something happens to you when you get sick while traveling. All of a sudden, traveling doesn’t feel as adventurous, spontaneous, and exciting as it did when you first started. It feels scary and uncertain, like taking back an ex, after he cheated. You love him, but your heart is broken by the betrayal. In my case, the betrayal was getting sick while in South Africa. I don’t know how I got sick. It could’ve been the lady who sat next to me on the way to Abu Dhabi and placed a bag of her bloody tissues (from her nosebleeds) on my leg while I slept or the coughing man across the aisle, on the way to Johannesburg. Side Note: Traveling is not as glamorous as the photos make it seem. All I know is, I got sick on the second night that I was in Johannesburg. We were headed back from a wonderful dinner, eating different meats from The Carnivore restaurant when I felt an itch in my throat and a chill. That night, I took a shower in hopes that I would feel better, but I got worst. There was a small chance that I caught the flu. As sick as I felt, I pushed through. I didn’t want the opportunity of being in South Africa, an absolute dream destination, to pass me by. Unbeknownst to me, you should never fly on a plane when you’re congested and sick. I had an upcoming flight to Capetown and I had to take it. While the flight began to land, my ears felt like it was exploding. The pain was excruciating. I thought I would be able to swallow and get my hearing back, but after we landed it never did come back. I had one great night in Cape Town, unable to hear in one ear but amazing nonetheless. As soon as I got off the plane, I headed to Mzoli’s which you can read about here. From there, my friend and I explored Capetown, had Cuban cigars and just lived it up. We were in South Africa for God Sakes. The next morning, we hiked Table Mountain. Halfway up the mountain (ie. 1500 feet) I felt like I was going to die. Doing what no one else in the history of this mountain has ever done, I decided to walk back down. I was getting sicker by the minute. I asked my Uber driver, who I flagged down randomly, (he literally picked me up from the side of the road… using hindsight I understand how dangerous this was) to take me to a pharmacy. I picked up some medicine in hopes that it would alleviate my sickness. When I got back to the hotel, I FaceTimed my friend who told me I looked terribly sick and urged me to see a doctor. After our conversation, I rested but soon enough, we had another tour scheduled to visit the Western Cape and Boulders Beach, home of the African Penguins. In the tour van, my body continued to grow weak. I tried to keep up with the others, but I was dying inside. When the tour was over, I was scheduled to meet up with my other friend who was staying with me during the trip. We had a new hotel that we would be staying at and I said my goodbyes to my friends, not knowing I would never be the same again. When I arrived at the new hotel, I asked the front desk to get me a doctor ASAP. I almost collapsed at their desk. Someone helped me to my room and I took a shower because my fever was getting worst. I felt like I was on fire. Upon my friend’s arrival, he urged me to go to a doctor. The concierge told me the price for the doctor to come to me and it was out of control. I planned on just seeing how I felt the next morning. By now, I was in South Africa for a week, and I had three more days to go. When I woke up the next morning, my pillow was covered in blood and mucous. It seemed like overnight my ears started to drain. I’d never been so frightened in my life. I didn’t even know your ears could bleed (ears actually can’t bleed, the blood was coming through my ears from somewhere else, I later learned). It was time for my friend to take me to the hospital. My hearing was gradually deteriorating and I was so weak my friend had to carry me. When we arrived to the first hospital, there were hundreds of faces staring at me. Some were ailing in pain, others sat patiently, waiting for their number to be called. We walked into a small room where a frantic doctor and nurse, overwhelmed by the crowd of people waiting to be treated, told me they could not help me. They said they had so many other sick people and there was no way they would get to me. These are the times, you appreciate America and their health care system. As messed up as we think it is, other countries are far worst. I walked out of there so faint, that I couldn’t stand on my own, let alone try to find another hospital. My friend took me back to the hotel and went on a search for doctors, pharmacies and anyone with knowledge that could help me. I continued to sleep and my ears continued to drain blood. It was absolutely disgusting. My friends back home suggested that I go to the U.S Embassy in South Africa and tell them about my situation. Thank God it didn’t have to come to that. After all of his researching, my friend finally found a doctor for me. This doctor was very different than the one that I went to the day before. His practice was located in a very upscale neighborhood in Cape Town. To put it into context, me and my friend were the only black faces in the vicinity. The doctor told me that I had a severe ear infection and that my eardrum ruptured while landing into Capetown. This is where I learned that flying while congested is very serious. I honestly had no clue. He put me on meds to hold me over until I got back to the States. I remained in bed for the remainder of my stay. My ears gradually started to get worst. I was beginning to lose hearing in both ears (only hearing the mucous swishing inside). Walking made me feel dizzy and nauseous. My friend had to carry me everywhere or walk very slow. I vomited every 10-steps. I also had to keep cotton balls in my ears and replaced them every 5-minutes because of the draining. Traveling back to the States was a nightmare. That 20-hour flight with a lay-over in Abu Dhabi was hell on earth. Sometimes I thank God for his mercy over my life because I wouldn’t wish what I experienced on my worst enemy. When we finally landed in New York, I went straight to bed and the next morning my mom rushed me to Urgent Care. I couldn’t walk without throwing up and I also walked very slow, like a baby taking his/her first steps. I still had a fever and was uncertain about my fate. Eventually, the doctors gave me strong medicine, stronger than what I took in South Africa and referred me to an Ear doctor. By this point, I could hear nothing around me. If people screamed, I couldn’t hear them. When I went to the ear doctor I learned that 50% of my hearing was gone. They did hearing tests on both ears and the verdict was bad. The doctors worried that they would have to operate if my ears didn’t get better. After a week, my hearing was still gone. The medicine they put me on was not strong enough. Before his last resort, which was surgery to drain my ears, the doctor put me on steroids. After 2-weeks, I started to feel slightly better. I was still struggling to hear, but my ears gradually began to pop, and when I say gradually I mean gradually (to this day they still pop and I do not have 100% of my hearing back, probably around 90% but I praise God every day for what I do have). After 3-weeks of being out of work, I was finally able to return. Everyone couldn’t believe my story, nor could I. My boss was nice enough to pay for me to get to work and go home in a taxi everyday because he knew I still had trouble walking and balancing. Finally, one day, I could hear clearer than I did the day before and each day after it progressively got better. There was one specific time that stuck out to me the most. I was on the elevator just coming from the ear doctor, in which he gave me bad news, that I could not go back to work and the initial medicine he put me on did not work for me. I was sad and defeated but also afraid to go home by myself because I couldn’t hear anyone if they talked to me (my aunt who accompanied me to the doctor had to go to work). I put in my headphones to give off the façade that I was listening to music. When I got into my building elevator, instinctively, I took off the headphones and not thinking, stood by the floor buttons. Someone asked me to press a floor for them. I didn’t hear. They asked again and I still couldn’t hear. So I pointed to each button until the person, bewildered by my actions, said yes, I’d chosen the correct floor 19. I cried when I got home. This is how deaf people feel every day. They’re present, but they are missing such a vital sense and others might judge them as being incapable or non-functioning. I cried because of the privilege I’ve had for so long, not even questioning what someone who is deaf might be feeling, how alone and isolated they might be. I became more aware. I became more grateful. I finally felt like myself again exactly a week before my 27th birthday. I decided to celebrate like it was 1999 (literally, I had a 90s brunch) because what I’d been through was grounds for a party. God is good. I now understand that this is something I had to go through. It was humbling. It made me more compassionate. And believe it or not, even though I couldn’t hear the outside world, I heard and talked to God the whole time. He knew what he had in store for me and how he was going to change my life, he just wanted me to be still and wait for him. I thank him for this time in my life. As scary as it was, he spared my life so that I could tell my story today; a story of resilience in the midst of adversity and strength. It was hard not hearing, but I learned so much during that period. Getting sick and losing my hearing while traveling changed my life in a way that I’d never expected it to and being able to share this story now, helps me to heal. A lot of people ask me if I would ever go back to South Africa, and the answer is yes, in a heartbeat. I love everything about South Africa; the culture, the people, I can go on and on. However, now, whenever I travel, I make sure I am prepared for anything and I mean anything. I drifted away from the city center of Capetown and gradually drove into the territory Guguletu, adorned with graffiti on walls that looked like it could compete with any painting at the Whitney Museum. The neighborhood children gleefully played soccer, barefoot in the scorching heat. The sun was still bright as I exited my Uber surrounded by a cacophony of sound and beautiful brown faces, all in the mood for a good time. I didn’t understand M’Zoli’s at first. Was I supposed to party and then get my food or vice versa? I learned soon enough that I had to place my food order first then I could enjoy the festivities. Through a glass freezer, I could choose from all types of meat including chicken, beef, sausage links, pork, and ribs. I chose just about everything and allowed the sales woman to weigh the meat and tell me my damage. Then I went to the back area, where a group of men were barbequing and they told me to come back in 30-mins. Inside the party, I found a seat next to a group of women, dancing rhythmically to the beat of drums, but the sounds of the drums mimicked the songs that the DJ played. These beautiful African women had smiles so bright and were filled with an almost contagious joy. I jumped up motioning to dance with them. I almost forgot to pick up my food from the grill. Needless to say, my food was delicious. You can almost taste the smoke on the meat. After days, of doing touristy things in South Africa, it was refreshing to be in the midst of my people, to experience this thing called bliss. Apparently African Pride Hotel in Johannesburg is the best hotel the city has to offer, and I got to stay there for a few days. I didn’t intend on it. What happened was I had a booking for it’s sister hotel Protea Fire & Ice hotel in Melrose Arch which is more of a girly boutique hotel, way cheaper, however they overbooked me. So the hotel offered that I stay at African Pride. Lucky Me! On the ride to the hotel, the driver explained how fortunate I was to be staying at this hotel, local celebrities and really distinguished people tend to stay there (pretty cool). This was especially important to me since, I was solo for the first couple of days on my trip, so I wanted to make sure I was in a lodging that was safe and very secure. Arriving in the neighborhood of my hotel, Melrose Arch was a treat. The atmosphere is so alive; there are restaurants all over the area, and people are just happy. However, I have to be honest, and share that I encountered my first problem while checking in. Somehow my debit card reached its limit for the day and would not allow me to pay. So I had to pay in cash, according to the hotel’s exchange rate, which was a ridiculous, rip off. Either way, I was just happy once I was able to check in, get free Wi-Fi and get ready for my night on the town as a solo traveler. The rooms at African Pride are really innovative. The walls are exposed brick. The bathtub is in the bedroom, which to some might be creepy but to me it was perfect and it’s just an overall cool space. It felt like a cute little studio apartment. The lighting was also really cool as well, I believe it was green. The room had treats, including some fruit and m&ms. I didn’t get to explore much of the hotel, but it’s a pretty dark hotel. Not illuminated by much light. The pool area is bright, but people don’t really go in the pool, they just sun bathe in the bungalows. The hotel is pretty small, well secured, and definitely a comfortable stay. The staff was cool. Not overly friendly, but okay. Was it my best hotel experience? I don’t know. I feel like I’ve had better experiences but the decor of this hotel is beautiful. “Welcome Home” chills went up and down my body after hearing those words. The man who said this to me was right. I was finally home and it was a long time coming. There’s really no way to prepare for a trip like going to the motherland. You kind of just go, which is the approach that I took, and using hindsight probably wasn’t the greatest of my ideas but you live and you learn. I got off the plane, in O.R Tambo International Airport, with a group of travel friends that I met on an amazing Facebook group called South Africa Glitch Gate. The first thing I did was exchange currency. I made the mistake of taking out a wad of U.S cash before leaving the states, which didn’t make much sense because I didn’t really use it. ATMs are the way to go in South Africa, so I took out about 2,000 rand, which was the equivalent of $125, from an ATM in the airport and it lasted me the first week of my stay. We took a van to each of our hotels while sharing our itineraries for the week. Kearan was our driver and he comes highly recommended. My hotel was in the Melrose Arch area of Johannesburg. Out of all the areas I could’ve chosen for lodging, Melrose Arch was the perfect area for me as I was traveling solo for the first few days. It’s sort of a gated community, filled with restaurants, hotels, and lavish shopping. My hotel was African Pride Melrose Arch, which I review here. My first few days in South Africa were spent exploring. When my friend Jessica finally arrived, we went to the Rosebank Mall and shopped in stores like River Island and Woolworth. We had plans to do so many touristy things that day including going on the Hop on and Hop Off bus and visiting the Cradle of Human Kind but the reality of being in South Africa hit us and we found ourselves wanting to drink wine while sitting by the pool, enjoying the beautiful summer weather. I got my ticket to South Africa for $590 on Theflightdeal.com in April 2015. Sign up for their email list so you can get flight deals too! The South Africa Glitch Gate is a group on Facebook that allows you to connect with other people who are either traveling to South Africa or already visited. We share tips, tricks, itineraries, restaurants, advice, and drivers. It’s a very informative group, and it helped me draft my itinerary based on all the information being shared. Currency – The South African currency is the Rand. When I went, it was 16-Rand to 1 US dollar, which was an excellent conversion. Like I said, as far as spending money goes, I don’t think I spent over $400 the whole trip and that approximation could be a stretch. Kearan Fourie was the driver that we used in Johannesburg. His email address is Kearanfourie@gmail.com. Feel free to email me if you need his mobile number as well. Sandton, Maboneg , and Melrose are great lodging spots in Johannesburg. I stayed at the African Pride Hotel. Click the link to read all about it. 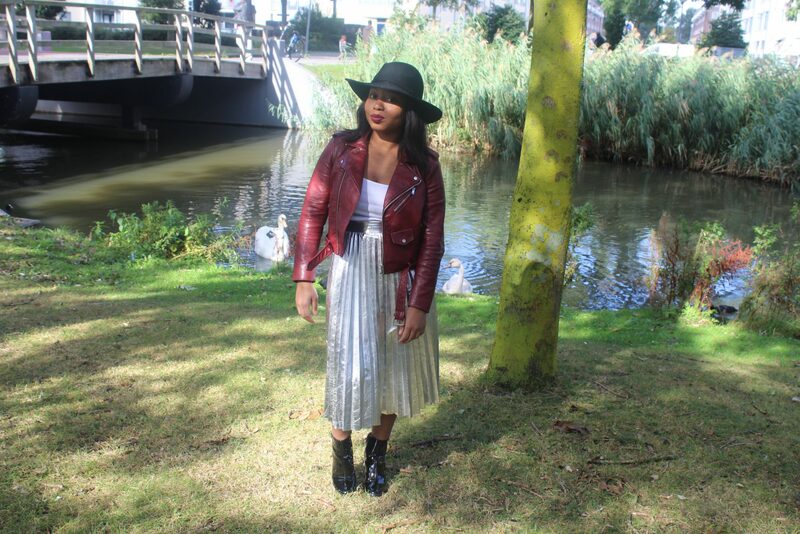 Kydee W South Africa Itinerary– I love sharing my itineraries for my trips. Hope this itinerary helps while you plan for your own trip to South Africa. I am going to South Africa in February 2016, and Madiba seemed liked the perfect introduction to South African cuisine. I found a $20 Groupon for $40 worth of food and asked Myllz to join me one night after work. 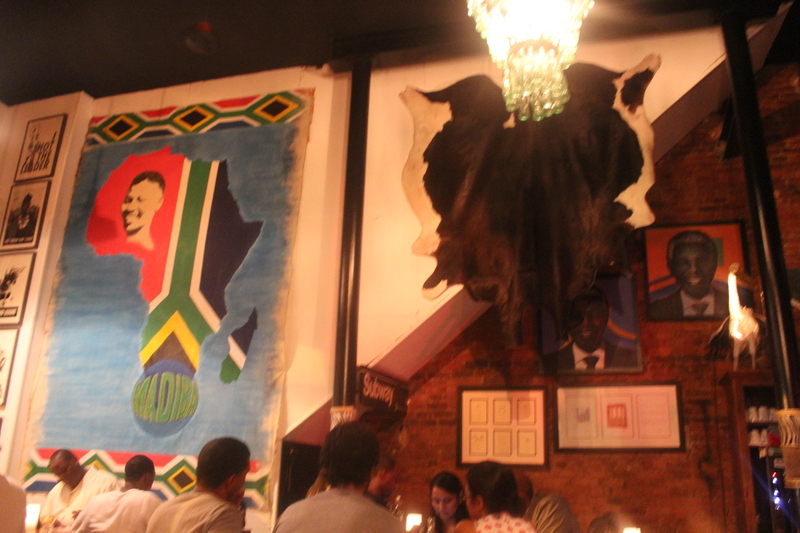 Madiba is a really cool and cultural restaurant. The outside, looks like a café of some sort. When you walk in, there’s the bar and a sitting area, with a huge bookshelf of South African inspired items for sale. The space looks really small until you’re led to their main dining area, which is a decent size. On the walls, you can’t help but to notice huge statement pieces and famous faces including: Nelson Mandela, President Obama, Animal skin and Animal print and the South African flag just to name a few. The menu is eclectic. We started with some Slap Chips, which are basically French fries drenched in salt and vinegar—This was kind of like eating salt and vinegar chips, pretty tasty. For drinks, we shared a pitcher of the Obama Mama, which is a rum infused fruit concoction; the pitcher was huge and we couldn’t finish it. For the main course, we split the Salmon Burger, which was remarkable, but I love salmon, so I would say that regardless. 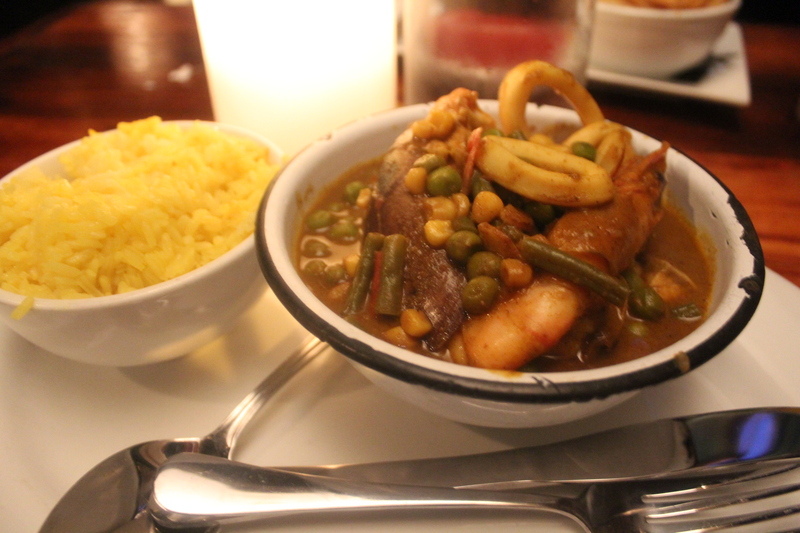 We also had the Durban styled Seafood Curry with Rice. The curry dish was well seasoned and consisted of an array of squid, fish, prongs, peas, green beans, and corn. Overall, the customer service was good. 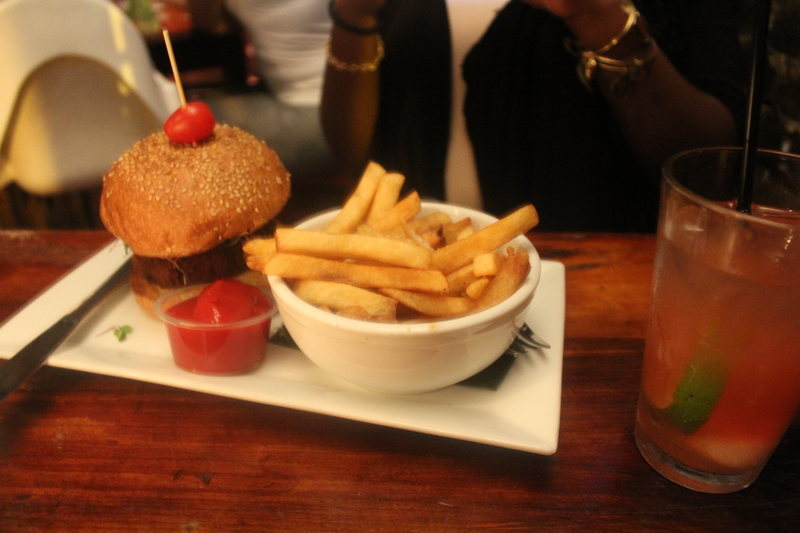 The food was really tasty and reasonably priced. I would definitely recommend, this place for anyone interested in trying something new. I really enjoyed my experience here.